Twinkling lights and holiday decorations provide a magical glow. Cherished family traditions and get togethers are planned with loved ones and friends. Shopping begins for the perfect gifts to give. Behavioral Health Therapist Yashia Durham, LCSW, LCAS, agrees that everyday stressors combined with the added pressures of the holidays can create difficult situations. Durham is a behavioral therapist who treats a variety of ages from children to adults at Monarch’s Cary, Zebulon and Wake Forest Behavioral Health offices. With preparation and planning, Durham believes that stress can be reduced or avoided. Set Boundaries for Peace, Joy . . . or Bah, Humbug! Celebrating with extended family and loved ones can be one enjoyable aspect of the holidays for some. But, Durham says without boundaries these events can cause stress for others. “Holiday stress can be due to accommodating others, gift buying, hosting holiday events coupled with every day stressors,” Durham says. Death and grief can be difficult to deal with, especially during the holidays. Durham said when loved ones pass away, traditions and unique ways of celebrating the holidays can change. It’s important to recognize and acknowledge these feelings and see who is willing to take on some traditional roles. “Maybe the person who passed was a peacekeeper. Talk to family members and discuss who is going to do what, getting everyone on the same page,” Durham suggests. 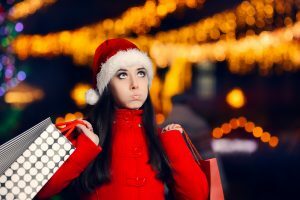 If common stress reducing techniques aren’t working, help with getting through the holidays can be sought from a variety of sources who can listen and advise such as a professional therapist, counselor or religious leader. “They can help process those emotions and there is no shame in that,” Durham notes. The essence of the holidays is to spend time with family and friends. Durham suggests being open and honest about feelings in combination with setting realistic expectations ahead of time to enjoy all that the season has to offer.